Often, when a football manager loses his job, there's not a lot of sympathy for him. Inevitably, the reasons for his dismissal - usually a string of rotten results and performances - have left the fans fed up and baying for blood. Ultimately, the relationship between boss and club is so damaged that one imagines the conversation with the chairman to be akin to that of Milhouse's Dad getting fired from the Cracker Factory - "So that's it after 20 years? So long, good luck?" "I don't recall saying 'good luck'." Richie Foran's dismissal doesn't feel like that. There were no organised protests or banners against him. There was little even in terms of frustrated abuse from the stands. That's because he was considered to be a Caley Thistle Man. He had played for the club for seven and a half seasons, many of which were spent as club captain. He had married a local woman. Hell, he'd even managed to get himself arrested on Inverness High Street. It was only a matter of time until he ditched his Irish brogue and instead starting dropping his 't's whilst greeting opposing managers with "how's yersel, like?" The bottom line is that everyone associated with the club wanted him to succeed, and there was increasing sorrow as it became clear that he wouldn't. That's not to say that the support disagree with the decision to remove him - a full season in charge of the club had produced an overwhelming body of evidence that he simply wasn't up to the job. But it's not something to celebrate. Ditching the attacking, aesthetically-pleasing football he initially promised in favour of hoof-ball made a modicum of sense when 6ft 5in Lonsana Doumbouya was up front, but giving him no support whatsoever made it pointless. And continuing to punt long balls when 5ft 8in Billy Mckay was the target was crazy. Ross Draper and Liam Polworth spent weeks on end being played out of position until their confidence was destroyed. When used in their favoured roles, they thrived...only to be moved again the following week. The team was never set up with the opposition in mind. In derbies, we never pressed high up the pitch, even though Ross County's defenders are always uncomfortable in possession. Meanwhile, after the split, Kilmarnock's Jordan Jones terrorized Brad Mckay at Rugby Park; a few weeks earlier, he'd done the same at Caledonian Stadium to the point that Mckay had to be subbed at half-time. But Foran seemed to have completely forgotten. Aberdeen destroyed us in November by using Adam Rooney on the right and asking him to drift inside; six weeks later, Ross County did the same with Liam Boyce, and we had done nothing to counteract for that dreadful weakness. Meanwhile, every week it seemed that we conceded a goal because Iain Vigurs failed to track a runner from midfield, and nothing was done about that either. Foran was clearly backed by the board, as he was allowed to sign twelve players. Only Billy Mckay and Jamie McCart improved the team. Louis Laing and Henri Anier were brought in with no obvious strategy; clearly they were simply players with Premiership experience who Foran had heard of. Foran said at the start of January that he badly needed a midfielder who could break up play...and then went and signed a load of strikers instead. Foran frequently hung the players out to dry in post-match interviews, often criticizing their lack of fight and character. He ostracized striker Alex Fisher was three months for the alleged crime of chatting to a club down south about a pre-contract; when Fisher was finally restored to the team out of sheer desperacy, he scored six in the last six games and finished as top scorer. Foran's claim about "bad apples" in the dressing room after relegation was inexplicable, especially as it became clear from the clues he dropped that he was referring to youngsters Larnell Cole and Jake Mulraney. Both were signed by Foran, both were frequently played by him, and the manager had actually chosen to extend Cole's loan spell in January rather than let him go. And any manager who can't cope with a couple of petulant kids in his squad certainly can't be trusted to cope with a bunch of veterans. We were bottom already, with two points from nine games. We had been outfought and out-thought on Hogmanay by Ross County. After that match, Foran himself admitted that he wasn't good enough. We should have taken him at his word. Losing 3-0 at New Douglas Park was an abomination, particularly as the goals all came because we were a shambles defensively. Foran actually had a wee Sliding Doors moment a few days later; we were 2-0 down at half-time at home to Dundee, and had the Dark Blues turned the screw in the second half I think it would have been the end for him. However ICT battled back for a 2-2 draw, which gave the false impression that the players were fighting for him. Whilst we were unlucky to be behind at half-time, the team capitulated in incredible fashion in the final quarter of an hour. Larnell Cole got sent off for dissent, with captain Gary Warren earning the same fate after the final whistle. St. Johnstone literally walked through their disjointed opponents to score two late goals, and could have had two more in injury-time too. The poor attitude and discipline displayed just how dysfunctional the club had become. The Great Catastrophe of 2016/17, which has resulted in relegation to the Championship less than two years after we played a Europa League qualifier - from Bucharest to Brechin in two years, as some have put it - ultimately left the new board with little choice. Had Foran been retained, we would simply have ended up getting rid of him in the autumn after a nightmare start to next season caused by poor recruitment - who would have wanted to play for this lot, under that gaffer? - and a continuation of the malaise afflicting the squad. Well, the misery may be a long way away from ending. If some think going to Dumbarton and Dumfries instead of Ibrox and Celtic Park is bad enough, then consider that it might be a good while till Inverness are back facing Scotland's biggest and best clubs. 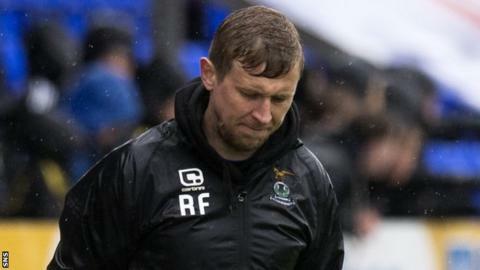 The Championship is a hell of a competitive league; Dundee United, Hibs and Rangers have recently discovered just how bloody difficult it is to get out of it, while St. Mirren very nearly left it by the wrong end. And of course relegation means less money, which means fewer resources, which means big changes. The League Cup starts in mid-July, after all. The sooner a new boss is brought in, the sooner he can decide on which out of contract players he wants to keep (probably only Fisher, really) and the sooner he can get on with getting a squad together. What should they look for? This writer is less interested in coaching ability and more keen on recruitment. Terry Butcher was hardly a tactical mastermind; his success in the Highlands came from his contacts and his ability to find good players in the English lower leagues. I'd prefer an experienced hand with that sort of wherewithall to the next Ian Cathro...though not a returning Butcher, who has burned his bridges with the club. I have no names in mind, though the ones being mentioned by the press - Maurice Malpas, Paul Sheerin, Paul Hartley - do not fill me with much confidence. One particular anomaly is the presence of Brian Rice, who was John Hughes' assistant but who chose to remain after Yogi left. I believe he has a contract for another year yet, but it's clear there was no obvious relationship between Rice and Foran. It hasn't helped matters a jot. The belated return to the club of Maurice Malpas in a coaching capacity (at the board's behest) will have done no harm but he wasn't really a Foran man either. A new boss needs to be able to bring in who he wants. As depressing as it sounds, there is a case for ditching the youth teams, which have produced all of four first team regulars (Graeme Shinnie, Nick Ross, Ryan Christie and Liam Polworth) this century. Every year we release a load of kids who go on to play in the Highland League. It surely isn't financially sensible. If Aaron Doran can get back to fitness, that midfield looks very decent. The back four would manage in the Championship, though I think Gary Warren and David Raven are fading and Brad Mckay will have found his level. Aside from that eleven, only backup keeper Ryan Esson is also under contract. I wouldn't be surprised to see Scott Boden negotiate his exit, but I hope the others don't have relegation release clauses. As for the out of contract players, Josh Meekings will surely move on. As for the others, only Alex Fisher is really worth keeping. Signings will depend partly on finance, and that might limit our options: in the First Division-winning campaign of 2009/10, we only used 18 players over the age of 21, and a few of them barely featured. The top priority is to try and convince Billy Mckay to remain in Inverness; with a half-decent team behind him, he could run riot in the second tier. However, that's probably not realistic. A decision has to be made on whether to gamble heavily on winning promotion at the first attempt; failing would cause considerable damage but every season spent in the second tier will make it harder to go back up. Just how rotten is Richie Foran's record?